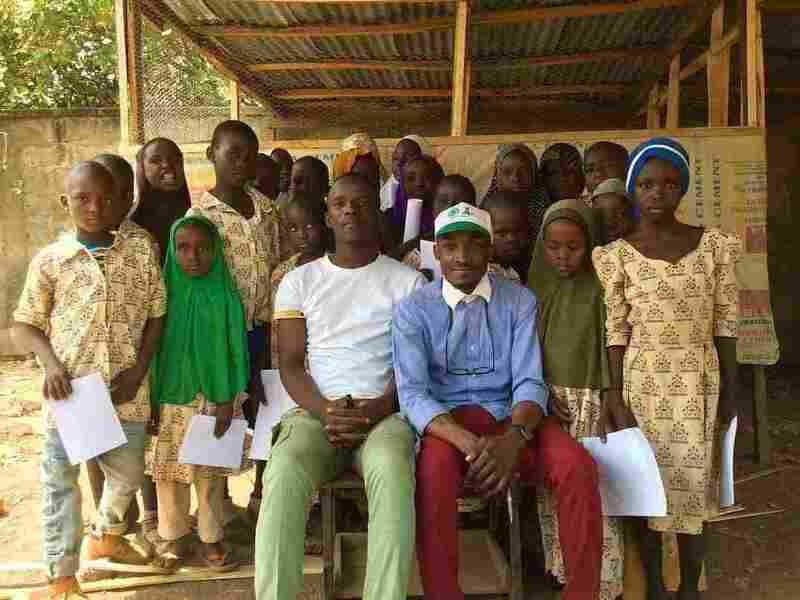 Two Young Nigerians Quit Their Office Jobs To Teach Kids In A Camp For Displaced People : Goats and Soda It started when a 20-something government worker in Nigeria visited a camp. And met the kids. And saw that they weren't getting much of an education. Aweofeso Adebola (in white shirt) and Ifeoluwa Ayomide (in cap) pose with some of their students. Zachariah Ibrahim, who dreams of being a pilot, stands behind the girl in the green hijab. Fatima Alidarunge, who wants to be a soldier to fight Boko Haram, is in the blue headgear. Zachariah Ibrahim dreams of being a pilot. That's not so unusual for a 13-year-old kid. But not that long ago, Zachariah didn't have many dreams for the future. Two young Nigerians helped give him hope again. Awofeso Adebola, 23, and Ifeoluwa Ayomide, 22, had well-paying jobs in the Nigerian parliament. Then Adebola visited the displaced person camp in Durumi, outside the capital city of Abuja, to donate relief materials. That's where Zachariah lives. The camp is home to some 2,000 people who've fled from the attacks of Boko Haram, which is fighting to carve out an Islamic state in the north of the country. "They were shooting people and burning down homes," the bristly-haired teenager says, tears welling up in his eyes. "My family trekked for four days with little food and water." That was in June 2014. In the camp, life is better, but there aren't a lot of services available. It's hard to get drinking water. And it's been hard to get an education. The Nigerian government runs the camp but doesn't give a lot of financial support, so donations from aid groups, individuals and churches help fill the gaps. The government originally established a school but did not provide teachers, so most of the children stayed away. That's what Adebola noticed when he first visited, and what made him return. Soon, Ayomide joined him. "I was amazed at how much time and effort he was putting in the camp, and I was inspired to support him," Ayomide says. Even though they had no training, the two young men decided to start a school. At first, Adebola and Ayomide juggled their government jobs with teaching, but halfway into the project, they quit completely in order to devote all their time to the school. Right now, they're living off their savings, support from family and friends and individual donations. They feel that for the students, their personal sacrifices are worth it. "We usually hold regular discussions where we ask them [the students] to tell us their future ambitions. Then we tell them what they must do to achieve, how hard they must study and work," Ayomide said. The camp classroom is made of wooden poles covered with tarps, with a few desks and blackboards. There is no formal curriculum yet, but with the help of a dozen other volunteers, Adebola and Ayomide teach English, math, history, civics, health, agricultural science and elementary science, using whatever materials they can get their hands on. Their students, ages four to 14, take regular classes from 8 a.m. until 2 p.m., and in between, go on short breaks to use the amusement facilities in the center of the camp — a metal swing and a manually-powered carousel. "You know there is real learning because dozens of the kids can read and write and also speak English. Most of them couldn't do any of these in the past," Adebola says. To keep the learners engaged, the two young men use donations to provide daily meals and offer prizes to the best pupil in every class at the end of every term. "We also organized sporting and painting competitions for the children," Ayomide says. "We always try to take them on excursions to interesting places in the heart of Abuja, like malls, theaters and museums." It's a far cry from the experience most children had before they arrived. Fatima Alidarunge, now 12, was barely 10 when Boko Haram militants attacked her town of Gwoza. She says that getting back to school in the camp has been helpful. "They gave us hope and happiness and made us believe in ourselves," she says, her gaze fixed on a tired Adebola, slumped over a chair in the single room that doubles as the school library and office. "I want to be a soldier when I finish my education because Boko Haram are killing people, and we need to stop them." Boko Haram, whose name means "Western education is forbidden" in the Hausa language, has attacked many schools in northern Nigeria, targeting teachers, education workers and students. The United Nations children's organization UNICEF says the conflict has forced more than one million children from school. At least 600 teachers have been killed by suspected Boko Haram terrorists and a further 19,000 have been forced to flee since 2009, according to the national union for teachers in Nigeria. In the Durumi camp, a dozen young children listen as a volunteer teacher recited the names of common animals in English. "This is a dog," the teacher says, pointing to a drawing on the board. The children repeat the word, their eyes fixed on the teacher. That's how English is taught to the younger ones. For older children, there are discussions and time for inquiry at the end of every class. The learning hasn't been consistent for all students. "When we started, we had about 300 children attending our classes, but now it is around 50 pupils because we don't have [enough] volunteers," Adebola says. "Most volunteers come and go, and that is a huge challenge," he adds. Besides encouraging children to attend regular classes, Adebola and Ayomide created the Young Farmers' Club to provide chickens for the kids to raise, riffing off the Gates Foundation's campaign to help poor families in sub-Saharan Africa. They constructed two large brooders and got 50 chicks. The children were divided into small groups and trained for one week, with the two men providing supplies like animal feed and drinking troughs. Now the club makes at least $10 per week selling the eggs, which goes back into the chicken project. Even though Adebola and Ayomide don't have formal teacher training, camp visitors say they are making a difference in the children's lives. "The two men are doing a great job, particularly as they offer education which can break the circle of poverty among the children, and the poultry farm also provides some source of livelihood and pushes the children to work hard," says Dr. Obinna Ebirim, a public health physician based in Abuja who visited the camp recently. Obitunwase Temitope is the project coordinator of Lagos-based Child Aid and Support Awareness Foundation. He runs a weekly hygiene and etiquette class for the kids in the camp. "We appreciate the work [they] are doing and recognize the effect of their mentorship in grooming the children from such deprived backgrounds to compete in the real world," Temitope says. The two young men are eager to get back to work but want to stay involved with the children. "We cannot leave these children, because they have become part of what gives us the courage to live and strive for success," Ayomide says. And they are gratified by the changes they see in the kids. As the sun begins to retire for the day, 13-year-old Zachariah turns to Adebola, who was urging three kids to clean up the drinking troughs and replace the water for the chickens. "Uncle, this is the chicken that laid the egg," he says, holding up a confused hen. "I hope we get more eggs soon so we can make more money for ourselves."